Francis Smylie/Smiley 1689 → Hugh Smiley 1723 → William Smiley 1757 → Hugh Smiley 1785 → Shepherd Parkman Smiley 1828 → Thomas Alexander Ward Smiley 1867-1951. 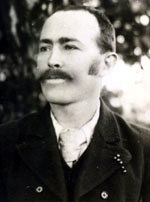 Thomas Alexander Ward Smiley was the sixth of the seven children of Shepherd Parkman and Margaret Phoebe (Ward) Smiley. He was born at Skipton where his father was stationed as a coach driver for Cobb and Co.
As a child, he moved frequently as the family moved around Victoria, a pattern he continued as an adult in his own right. But with his family eventually settling in St Kilda, this area also became his home. One family story suggests Tom Smiley played football for St Kilda. His name appears once in the squad named to play for the club but it is unclear if he actually went onto the field. The Argus on Friday, 15 March 1889, reported on the annual meeting of South St Kilda Football Club. Medals for good performance in the previous playing season were presented to, among others, T. Smiley of the 'first 20' squad - almost certainly Tom Smiley who at that time would have been aged 22. When he married Eliza Ann Johnston at the Registry Office in Fitzroy on 22 March 1890, he was living at St Kilda and he described his occupation as a carrier. Eliza, daughter of farmer John and Sarah Jane Johnston, had been born at Castlemaine in 1869. However, two years into their marriage, and at the age of 24, she died of liver failure while in the Alfred Hospital, on 27 April 1892. She was buried at St Kilda Cemetery the following day. On 26 August 1894 Tom married (2) Marion Harley Bunn, daughter of Henry Alfred and Margaret (Wilson) Bunn of St Kilda. At the time, he was aged 26 and living at Gooramadda, while she was 24 and living at her parents' home. The couple married at Rutherglen, near Gooramadda. In their early married life, the couple moved frequently as Tom worked as a boring (drilling) contractor, usually associated with drilling test holes. While Marion (known as Marnie) at first would return to her parents' home for the birth of her children, three of the later children were born wherever the couple were currently living - Pitfield Plains (southwest of Ballarat), Charlton and Kapunda (South Australia). The children found themselves changing houses and schools frequently, sometimes because their father's work would take them to a new area, but at other times because Tom liked to buy houses and sell them to make money. One family story came from Marnie, who said they had been staying at one place where gold had been found. Tom wouldn't leave but he came home one day to find the lino (linoleum floor covering) rolled up, the family belongings packed and the family ready to go, as they were down to their last pennies. The family also moved frequently within St Kilda, as Tom found houses to buy and sell. When travelling with a large family became too much, the family bought and operated a butchers shop at 338 Inkerman Road, St Kilda - a two storey building where Tom, their daughter Doris and son Shep (Shepherd Thomas) used to work. Tom also loved horses and knew them well. He would buy and sell them, making money on the deal. He also had a great sense of humour and a keen mind. Family stories about Tom's great (but sometimes annoying) sense of humour abound - examples include Marnie handing him a cup of tea and while her attention was elsewhere, he'd take the cup and she (feeling the weight lighten) would let go of the saucer that inevitably fell and smashed on the floor. She'd growl but he would say "I only asked for a CUP of tea." One of their sons, Phil, said they grew up in a home of many saucerless cups! Another example involved their living in St Kilda, right by the church. Each Sunday evening young people were invited back for supper. Whenever a new young man joined, Tom would ask him for help in another room. Tom would stand on a chair, hold a glass of water up against the ceiling, and then ask the youth to hold up a broom to support the glass. Tom would then get off the chair, carry it to another room and leave the hapless young man standing. Obviously others had been through this "initiation' ceremony and there were many laughs. 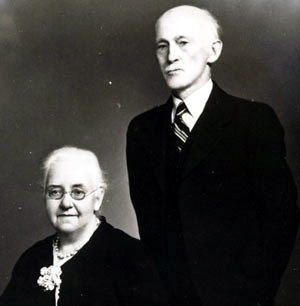 Tom and Marnie remained in Melbourne until their deaths - Tom died at Brighton on 7 May 1951 at the age of 83, and Marnie died at Malvern on 9 April 1957 aged 86. 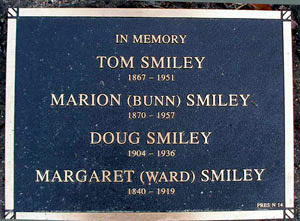 Both were buried at Brighton Cemetery, in the one grave (Pres N 14) which is also the resting place of one of their children, Douglas Ward Smiley, and Tom's mother, Margaret Phoebe (Ward) Smiley. Pictured at right is the plaque on their grave.